Government should address �teething troubles� haunting exporters under GST said Mr Chandrajit Banerjee,Director General, CII on 28th Sept. Mr Banerjee reeled out the GST reforms wishlist for Export Import(EXIM) community including Payment of IGST for imports under Advance Authorisation, EPCG and on advance receipts adds to credit requirements of manufacturers and raises costs. All import duties including IGST should be allowed to be debited under Advance Authorization as the authorization is utilised for self and the finished goods manufactured from imported material is exported. Further, advance receipts for exports should be exempted from payment of IGST, Suggested Mr Banerjee. Another important issue is that under VAT/CST, merchant exporters could purchase goods without payment of tax on furnishing of a declaration form. This provision needs to be added under the GST law so that refund of tax is faster and capital is not held up. Currently, the tax for inputs for exports is needed to be paid directly even though provision for refund is provided. Further, delays in filing of GSTR 3 should be addressed for quick refunds of IGST paid on exports, stated Mr Banerjee. 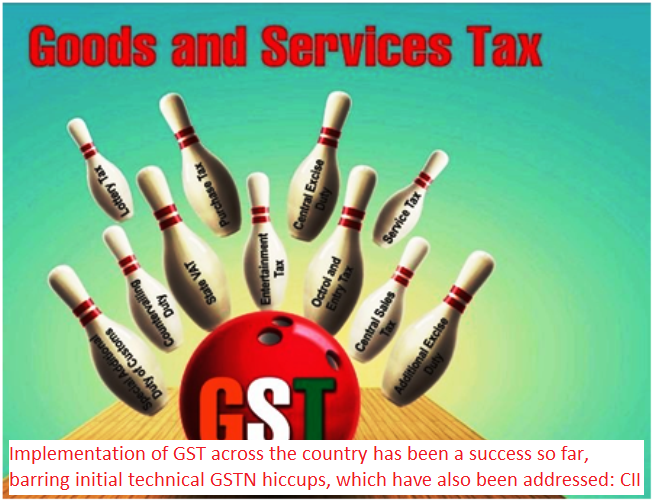 Goods and Services Tax (GST) was implemented on 1 July, 2017 with a view to create a common national market by amalgamating multiple central and state taxes into a single tax regime. Implementation of GST across the country has been a success so far, barring initial technical GSTN hiccups, which have also been addressed. Payment of tax on a single GSTN platform, seamless flow of input tax credit (ITC) and removal of various state barriers for smooth movement of goods across Sates is the mainstay of the GST reform; commended Mr Banerjee. Applauding the roll out of GST, Director General, CII stated that since the launch of GST, Government has left no stone unturned and the GST Policy Wing, GST Council and senior officers of the CBEC have been proactively engaging with the industry in spreading the awareness in terms of issuing FAQs, issuing clarifications and addressing concerns of the industry with the intent to help implement GST. Several CII requests have been considered to fine-tune GST Law, tweaking GST Rates and clarifying provisions, which are indeed helpful in successful transition to GST, he said. Today, we need to handhold the industry, especially the MSME sector, emphasized Mr Banerjee. For ease of doing business especially for the MSME, provisional Input tax credit period may be extended to 6 months from the current 2 months� period; this will help cross matching of invoices through the GSTN portal and also save the blockage of the working capital for the small players, said CII top brass. Filing of GST Return may be made on a quarterly basis, as against the current monthly filing requirement as the MSME sector is still not well equipped with the IT infrastructure and a qualified manpower; this small measure will help bring them into the GST mainstream, emphasized Mr Banerjee.